The BASrouter 3.0 from Contemporary Controls has been independently tested and has obtained BACnet Testing Laboratories (BTL) certification. It is BTL listed for both B-RTR and B-BBMD device profiles to ensure seamless integration into BACnet networks. This robust and versatile BASrouter — which provides stand-alone routing between BACnet networks such as BACnet/IP, BACnet Ethernet, and BACnet MS/TP — will seamlessly allow system integrators to mix BACnet network technologies within a single network. In addition to its field-proven operation, the BASrouter has several diagnostic capabilities built into its 3.0 firmware. 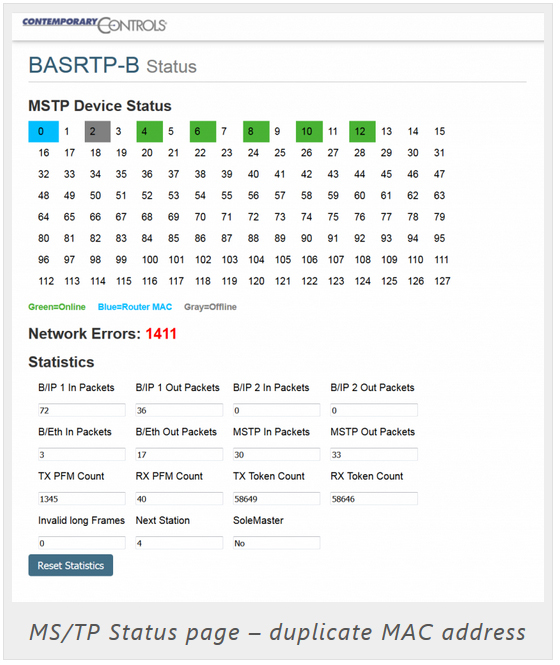 By pairing the BASrouter's diagnostic capabilities with a BACnet utility such as the free BACnet Discovery Tool (BDT) from Contemporary Controls, you are well-armed to troubleshoot BACnet networks in the field. The BASrouter installation guide contains the essential power and network configuration information needed for a successful installation, but the real world does not always allow for perfect scenarios. The most basic, and really the first step to troubleshooting your BACnet network using the BASrouter is to look at the Ethernet and MS/TP Receive LED lights on the front of the device. These lights are a good indicator of network activity. A bicolor Ethernet LED glows green for 100 Mbps, and yellow for 10 Mbps, and indicates activity by flashing. The MS/TP Receive green LED flashes rapidly when valid MS/TP traffic is received. When flashing continuously and without interruptions, the LED is a good indicator that the MS/TP network is operational. If there are long interruptions in the MS/TP Receive LED, you may have some issues on the MS/TP segment. The BASrouter has a resident web server which allows for commissioning and troubleshooting using a standard web browser. Use the Status page to troubleshoot the segment further. The Status webpage (see image below) can be helpful in analyzing the MS/TP network segment where the BASrouter is connected. The Status screen is always operational and keeps tabs on activity. It consists of an MS/TP Device Status table with color-coded blocks for each device, Network Errors count (in red), and router traffic Statistics. The Status page will automatically refresh every 5 seconds with the updated status on networks and devices — so you can observe the network state changes and gain insight into the condition of the BACnet network (as seen by the BASrouter). These statistics are retained over time, unless the BASrouter is powered off or rebooted from the main web page using the Save Changes button, then all Status page parameters are reset. Further Ethernet network troubleshooting can be performed by using a diagnostic switch such as the Skorpion Diagnostic Switch which can assist in troubleshooting Ethernet networks by allowing a network protocol analyzer such as Wireshark® to attach to an unused port on the switch and observe all traffic on the network. Skorpion Diagnostic Switches retain all the features of an unmanaged switch but perform like a repeating hub where all received messages are flooded to all other ports. Mounting a diagnostic switch next to your BASrouter allows you to easily perform IP network troubleshooting.